Midnyte Reader: Frightful Fall Read-a-Thon Giveaway. Have you signed for the Frightfull Fall Readathon? If not, you can do so HERE. I am very excited for this event because I need to read lots of scary books this month! ~The Books of Blood volume 1-3 by Clive Barker. ~The Name of the Star by Maureen Johnson. I'm not sure I'll be able to complete all of these books and I may of course switch some titles too. 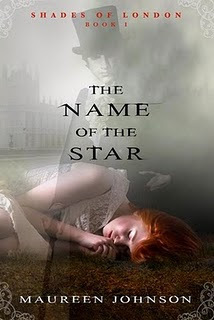 To help celebrate the Read-a-Thon, I'm giving away a signed copy of The Name of the Star by Maureen Johnson. 1. You MUST be signed up for the Frightful Fall Read-a-thon hosted by The True Book Addict at Castle Macabre. If you have not signed up, click HERE or click on the Frighful Fall Read-A-Thon graphic in my sidebar! 3. Please fill out the Rafflecopter form. The only requirement besides signing up for the Read-A-Thon is to leave a comment. 4. Other entries are optional. 1. Did I mention you MUST be signed up for the Frightful Fall Read-a-thon hosted by The True Book Addict at Castle Macabre? 2. This contest is open internationally. 3. This contest is open until the end of the Read-a-thon and will close on October 10, 2011 at 12:01 am EST. 4. Please see my contest policy HERE. 5. Winner will be chosen by Rafflecopter. 6. Winner will be notified within 48 hours. If I cannot get in touch with the winner within 72 hours from my first e-mail, another winner will be chosen. You have an awesome list of books lined up. I read Books of Blood years ago and it still remains one of my favorite collections of short stories. Clive Barker definitely knows horror. Hope you enjoy the read-a-thon and thanks again for hosting a giveaway! Good luck everyone with the Read A Thon. @Lisa-I'm looking forward to seeing what you pick. @Tiffany-I listened to 1 book by H. Graham but didn't love it. I have another one I want to read...I think it's her newest. @Michelle-I haven't heard of those. I'll have to look them up. I'm glad you liked Clive Barker b/c I hate being disappointed. @Orchid-I want to read the Monstrumologist as well. @Moira - I want to read Anna Dressed in Blood Too! I have lots of books lined up to choose from, but I guess The Poisoned House by Michael Ford, but still haven't started it. I thought I entered already. Oh well, I am here now. Thanks for a great giveway. My most anticipated read is Dearly Departed by Lia Habel. It's really really good so far. I'm really enjoying Henry VIII: Wolfman! I was kind of disappointed by Pride and Prejudice and Zombies but this one is awesome so far! I really want to read this one. I feel like I've had it on hold from my library for forever :) Thanks for the great giveaway! I finished most of what I wanted to get done, so I'm pretty happy with my read-a-thon. This looks cool and special thanks for hosting!